I have a new appreciation for the long time hair designers of Second Life. Do you people even realise how many hours went into that hair you got for $L195 or about 70 cents usd? 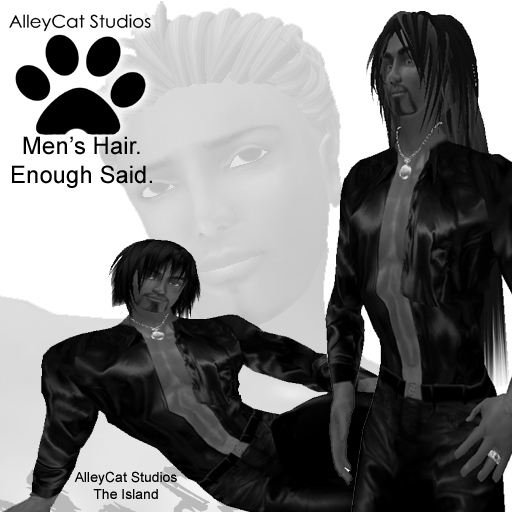 I just started to make some hair for guys I will have out at my store, AlleyCat Studios, in a few weeks. But since they are seriously lacking in good mens styles I spent about 20 hours making 1 yes ONE style of hair. Twenty hours in all. How? Well first you make the style.. then you fit the style, then you do all the recolors for that style, then photograph the style, then box it and set it out for sale. That is a lot of work! So next time you find that awesome hair, take a moment to thank the designer for making it possible, chances are they spent over 20 hours on it! And we have not even covered marketing the hair..